An underwater restaurant? Say it isn't so! 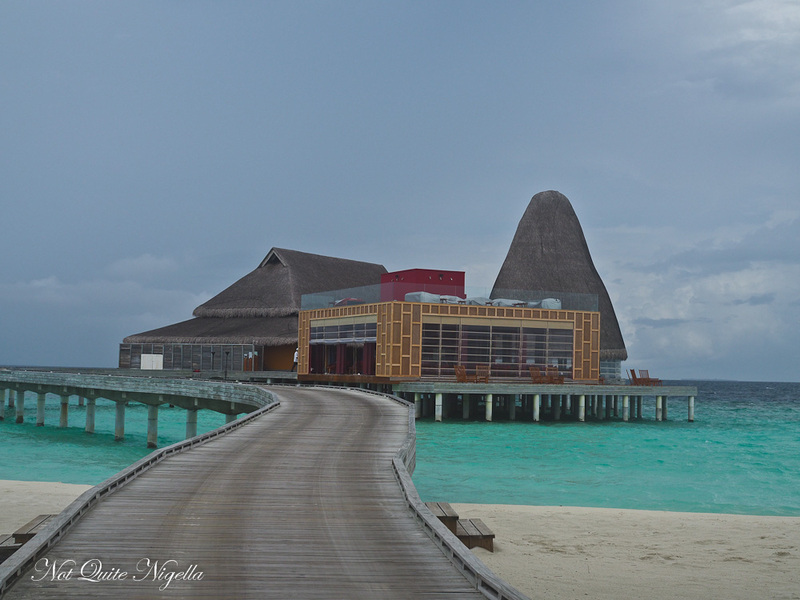 Sea underwater restaurant at the Anantara Kihavah is built on the edge of a natural reef right near the deep sea so the sea life is extraordinary. 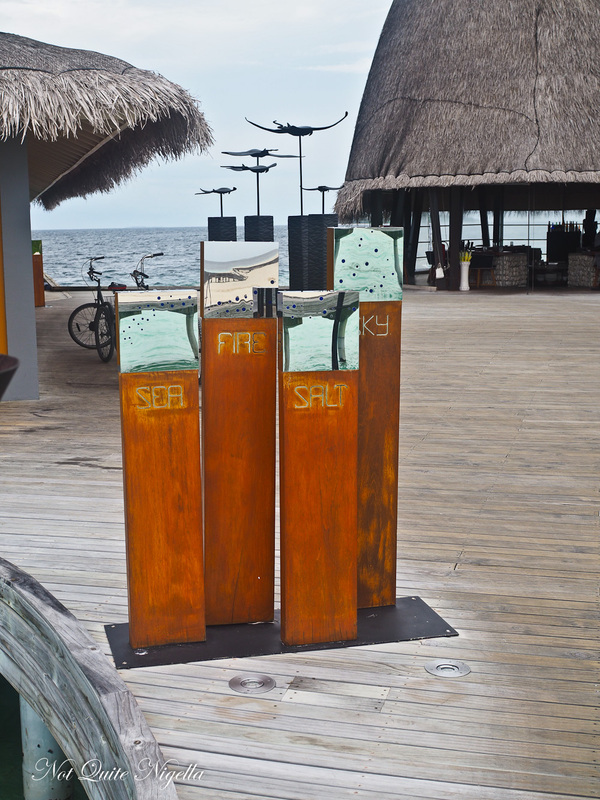 Instead of snorkelling to see the fish, you can dine next to them! The morning of our lunch at Sea I woke up excited. And a little bit worried. You see I'm claustrophobic and I wasn't sure if I would find the subterranean setting of Sea restaurant a bit too much for me. But once I get there, I have to admit I was unprepared for how stunning it is. Eat slowly because the food can come out quickly and before you know it, you're finished in 2 hours and all you want to do is stay forever. Forget speakeasys and member's clubs, it's like getting admittance to a whole new world. The underwater world. 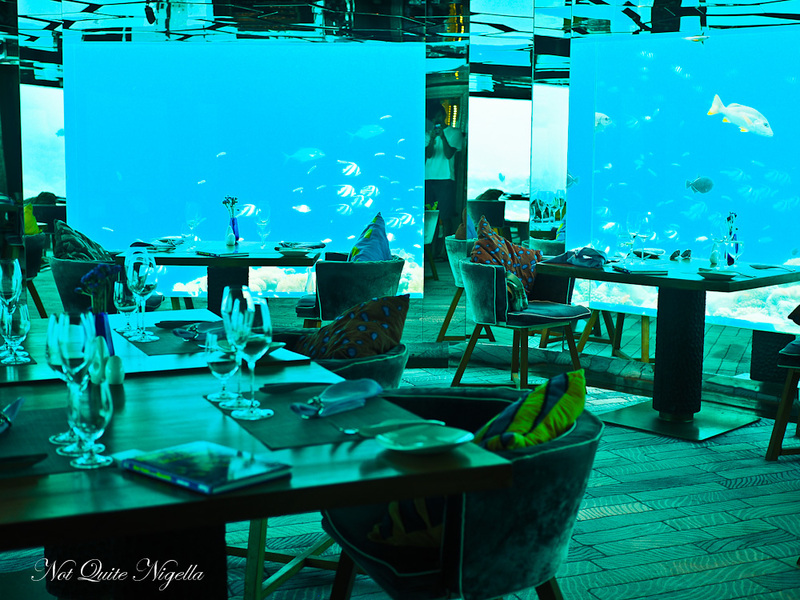 Some facts: Sea took more than a year to build and whilst it isn't the world's first underwater restaurant, it has the first underwater wine cellar with an incredible wine list including bottles of Petrus with 380 labels from 20 countries. The glass walls are around 100mm or 4 inches thick and the windows are 1.5x1.6 metres large. They guestimate that you see on average 37 species of dish during lunch. And who cleans the windows? It's the team from the Elements dive school who are responsible for the twice weekly job of cleaning windows. 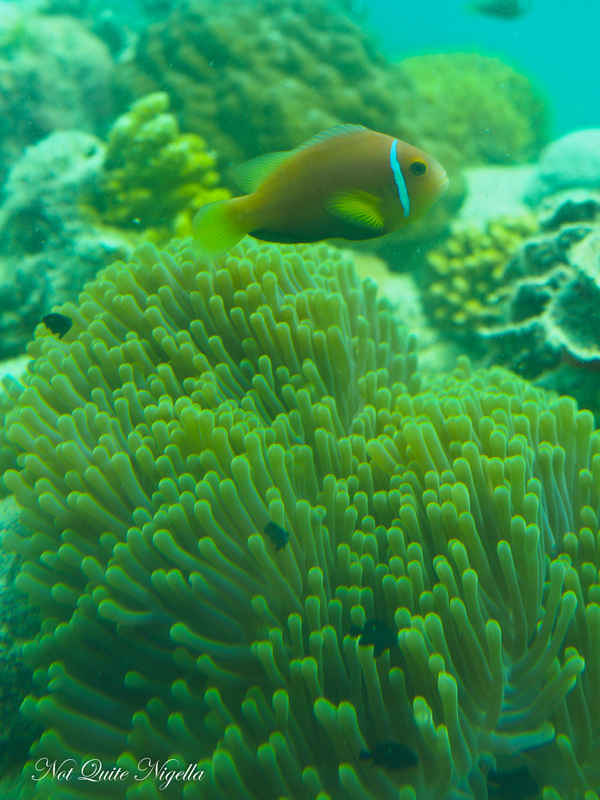 The fish are not fed here and it is a natural reef although they have helped it along with some additional coral. Dining underwater also doesn't come cheap. The 16 seater restaurant is open for breakfast, lunch and dinner. 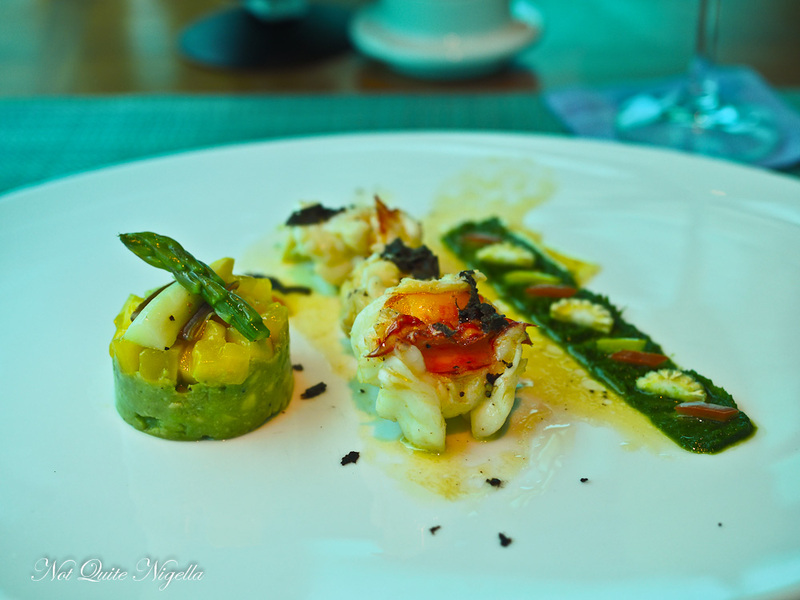 A four course lunch is $245USD per person and if you want matching wines, that's another $275USD on top of that too. I have a tip: arrive on time because the first to arrive get their choice of where they sit. 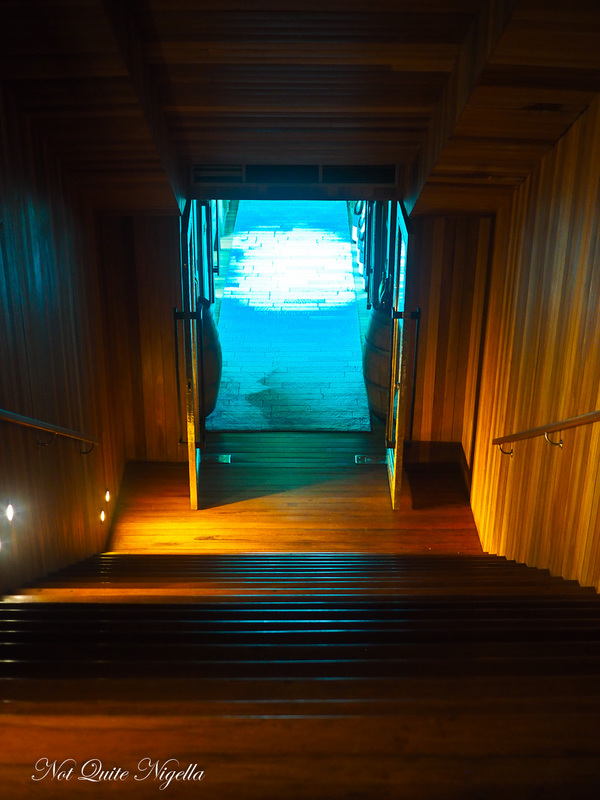 The fish do move around but the tables to the centre right when you walk in are best because they're located near the deep sea drop off which means that there are more fish to look at. The daytime experience is also different from the nighttime experience-at night there are larger fish and the sharks come out to play. 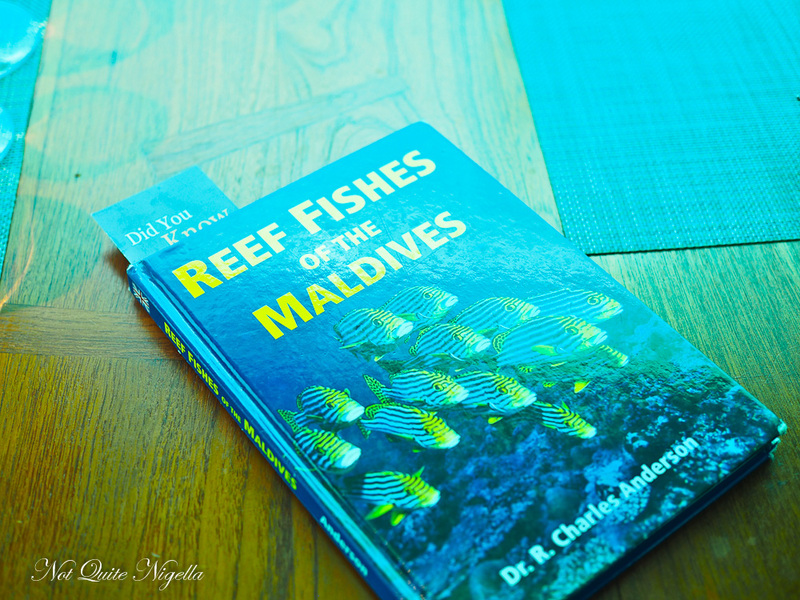 On each table is a helpful book detailing the tropical fish of the Maldives. It's a cold restaurant because of the wine cellar and they will happily bring you a wrap to wear (blue of course) if you feel a chill. Even the cushions match the patterns on the fish. They bring wet towels over which they pour scented water over-today's scent (it changes daily) is orange. 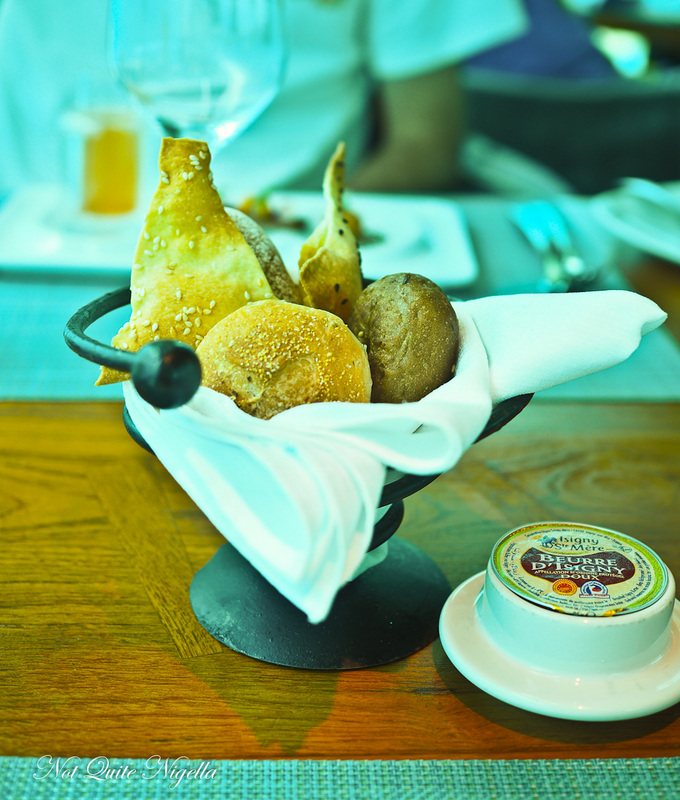 A bread basket is brought over and it contains lavosh, soft rolls and olive buns alongside some butter. I'm hungry, oh so hungry. 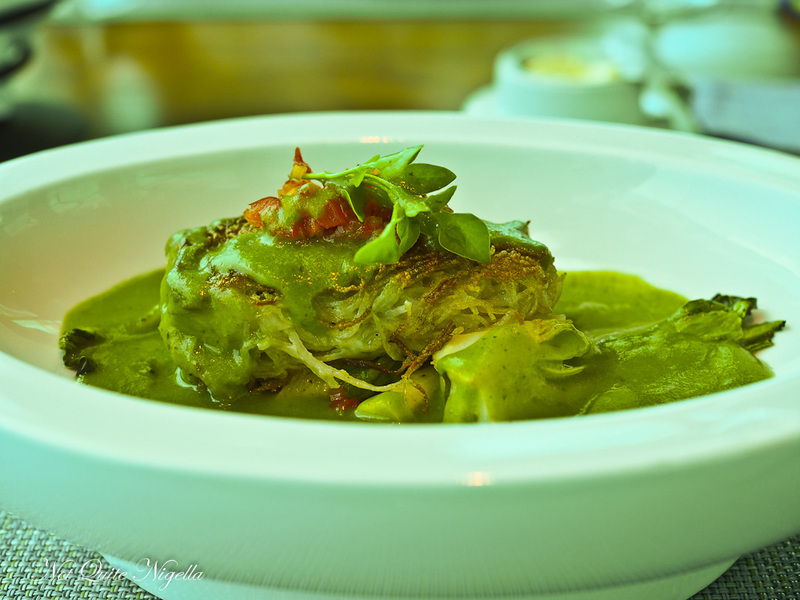 We choose different dishes so that we can try as much as possible. The pace is quick here and before long there is an amuse bouche. 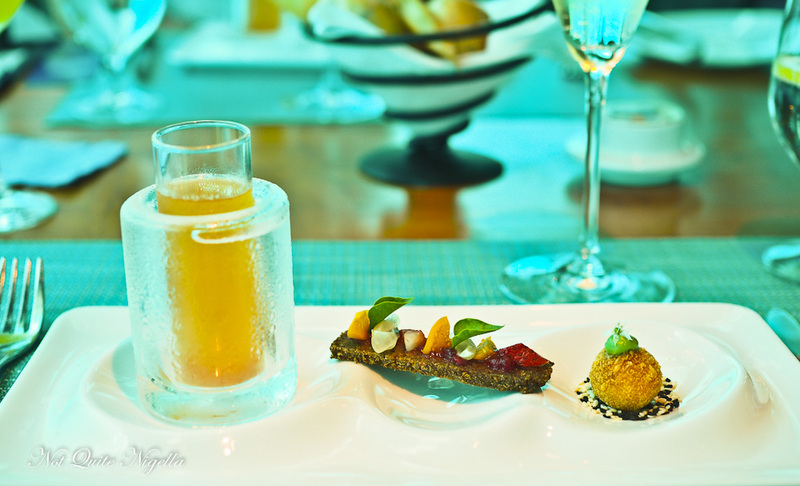 It's a tomato consomme, pumpernickel with fruit compote and a shrimp arancini. It's a delicious start to the meal, especially the shrimp arancini, along with the fantastic bread basket. The lobster medallions come three to a serve. On the right hand side there is asparagus and jamon iberico and on the other side there is an avocado and mango guacamole with citrus coriander and spring onion oil. It is a light, delicately flavoured dish. The foie gras is served atop slices of fried duckling. There is also plum, orange and ginger marmalade on top and a gorgeous fried garlic jus. 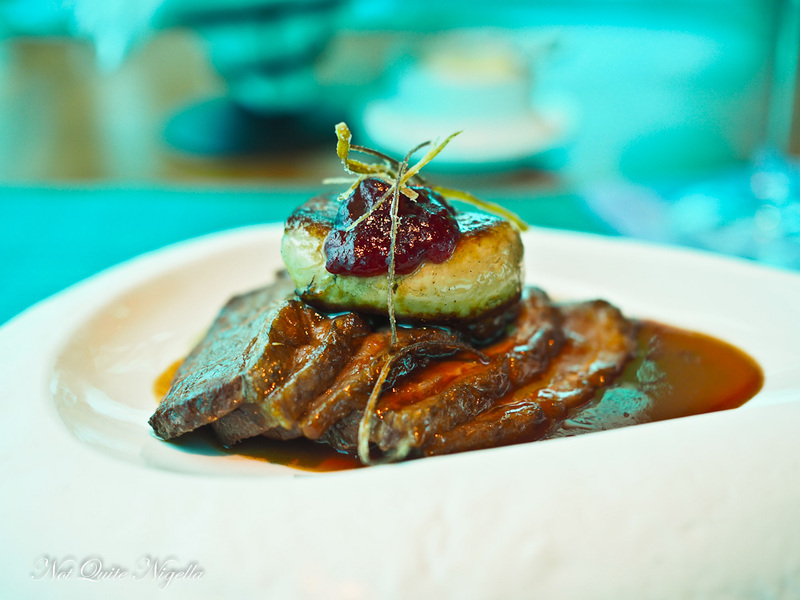 The star anise and Chinese spices work well especially with the sweetness of the marmalade and seared foie gras. The second course has a choice of two soups and we order one each. 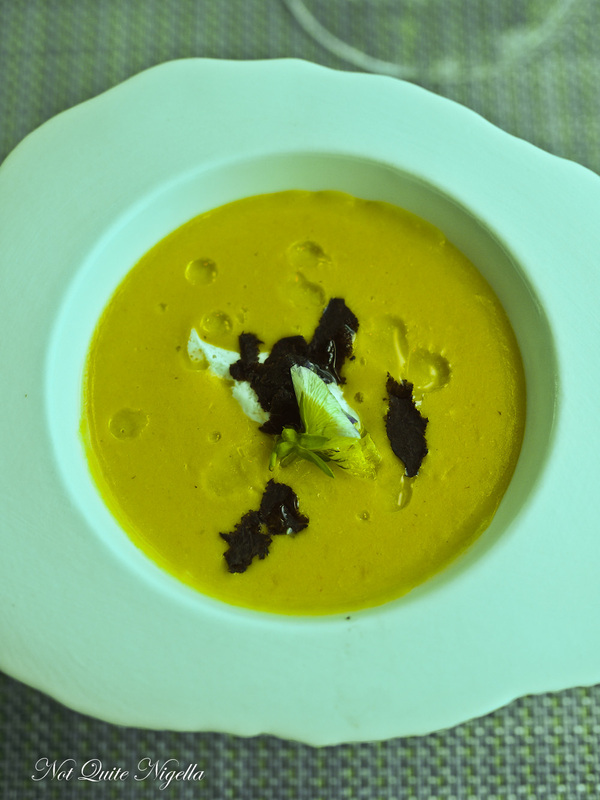 The first is a creamy roasted leek and potato soup with shavings of black truffle on top and a poached quail egg. It's rich and creamy but I would have loved the quail egg a little less cooked through, particularly the yolk. 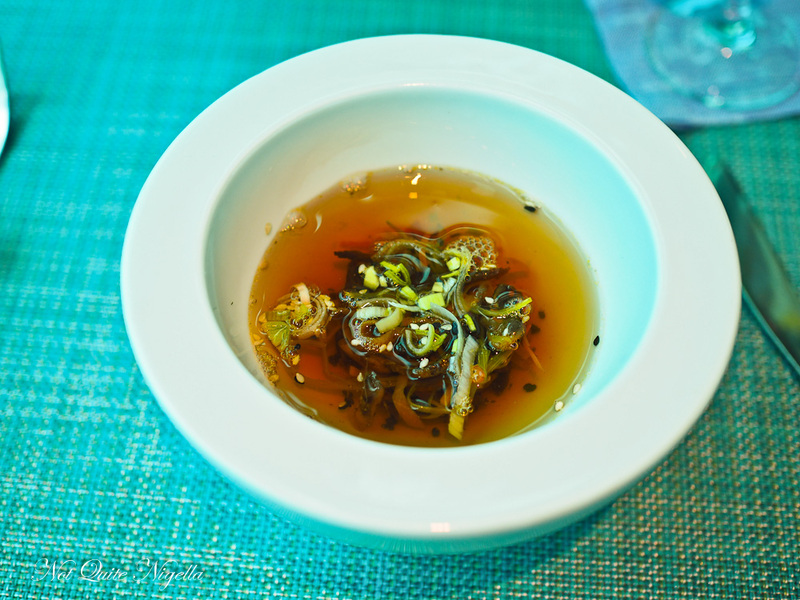 I actually prefer the lighter consomme which is stronger in flavour with slivers of Peking duck, grilled shiitake mushrooms, sesame and spring onion. 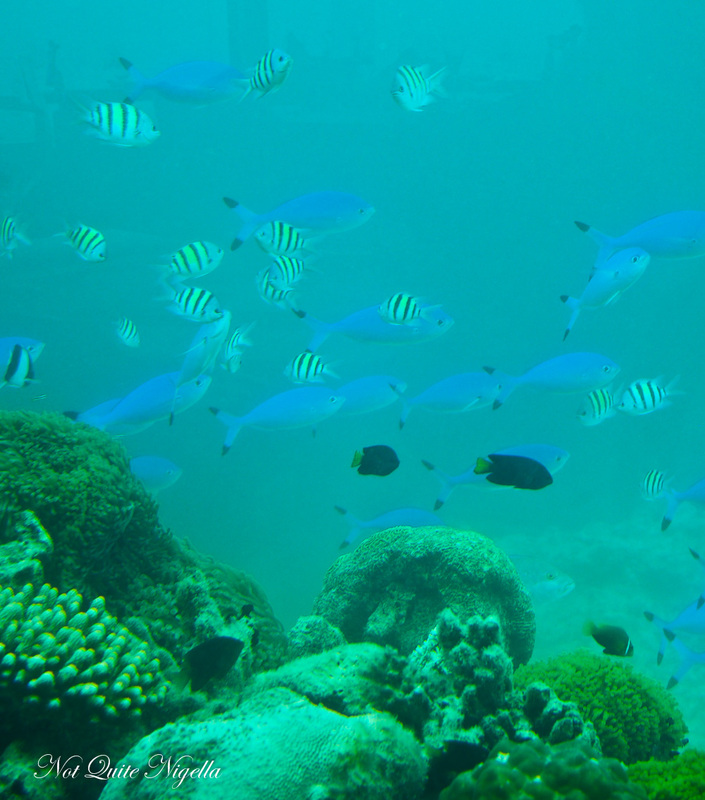 The thing about being here is that you cannot stop watching the underwater world around you. 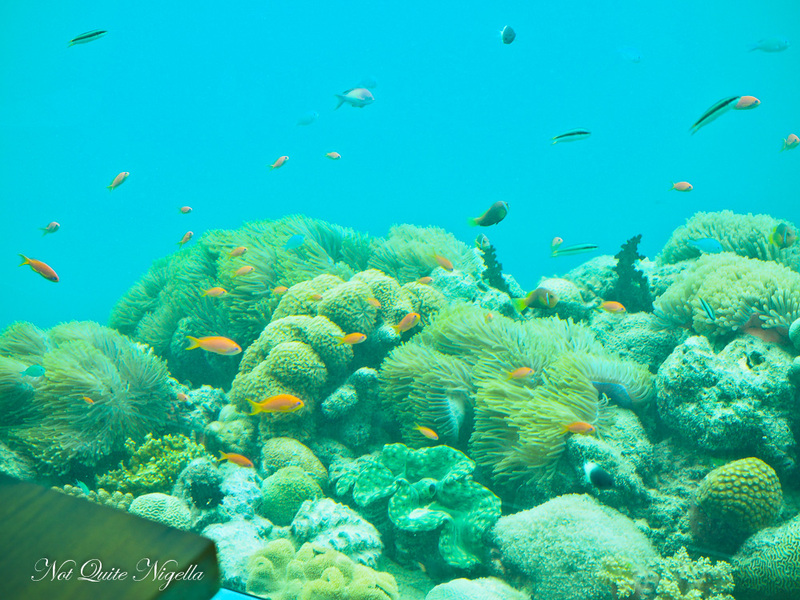 We see soldier fish, double saddled bannerfish, one spotted snappers and so many other fish that we lose count of names flicking back and forth with the book. Service is absolutely wonderful and they seem as excited as we are when an interesting fish swims past or something unusual happens. 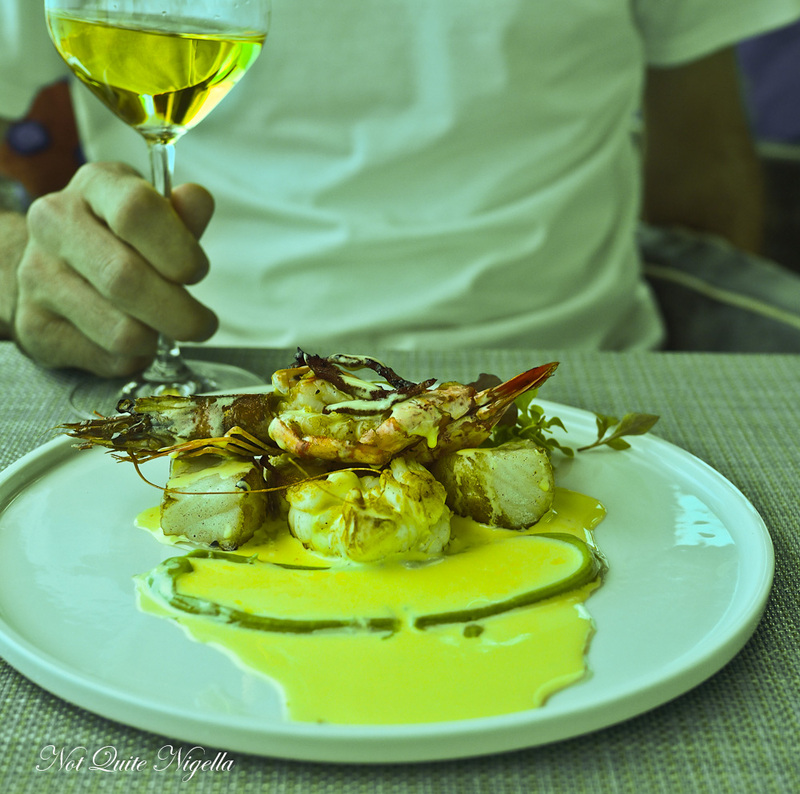 It was all about seafood today which befits the setting. Our main is a fillet of shredded potato crusted seabream topped with Taggiasca olive and bell pepper brunoise and baby vegetables. They pour the sauce of pea and mint on top. The potato does get softer once it has the puree on top of it. There is a nice amount of variety in this seafood plate with lobster, prawns, local reef fish and imported sea bass medallions. To the side are thin crispy strips of chorizo and a white wine lemon butter sauce with avocado puree. There's a sudden movement out of the corner of our eye-it's the Jack fish who eat the smaller fish and their fast speed causes fish to disperse in all directions. Then everyone gets up excited-there's a turtle swimming past slowly and steadily. It disappears off into the distance. Dessert time! 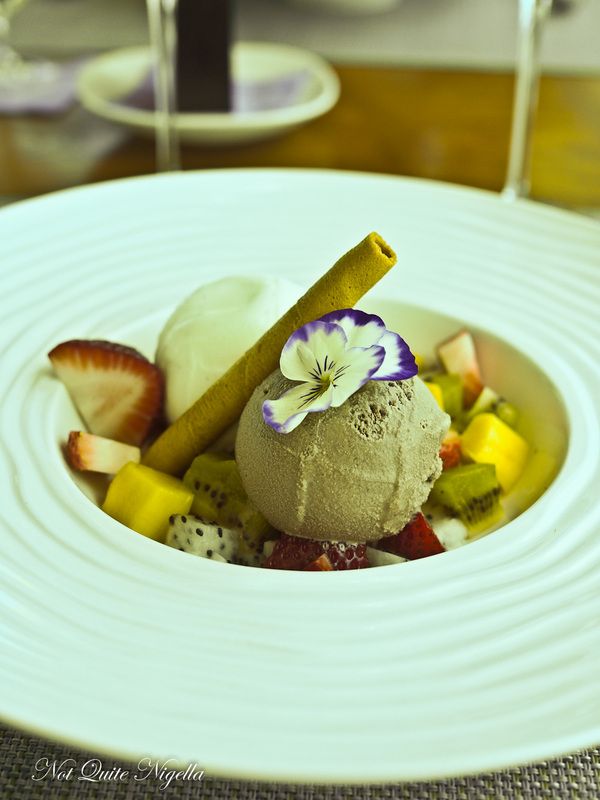 I usually don't like fruit salad except on planes but I love the vanilla gelato with the macerated fruit salad. Mr NQN doesn't even know what to do with me now that I have proclaimed a love of fruit salad! It's temporary though I am relieved to report ;). The chocolate bomb is served at the table. 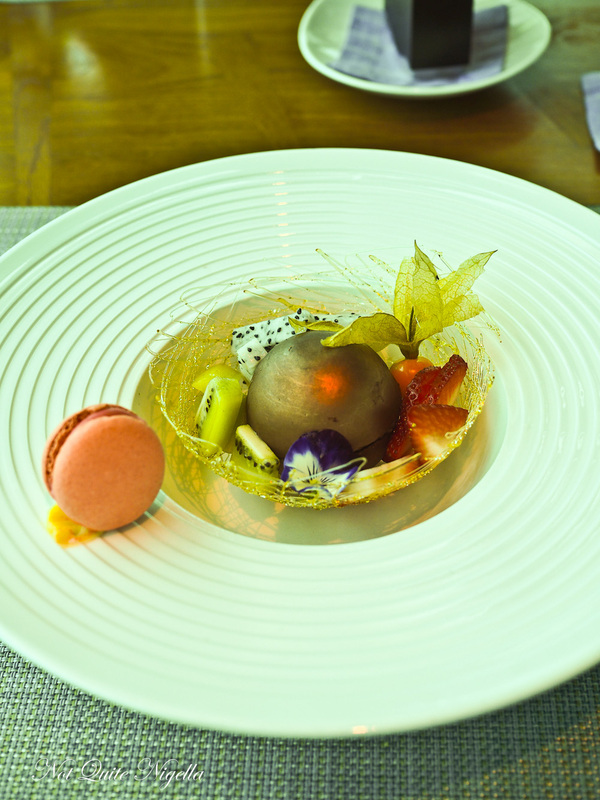 It is filled with chocolate ganache and crunchy mascarpone coffee parfait and they pour the caramel sauce on the shell and it melts into a rich chocolately fruit dessert. 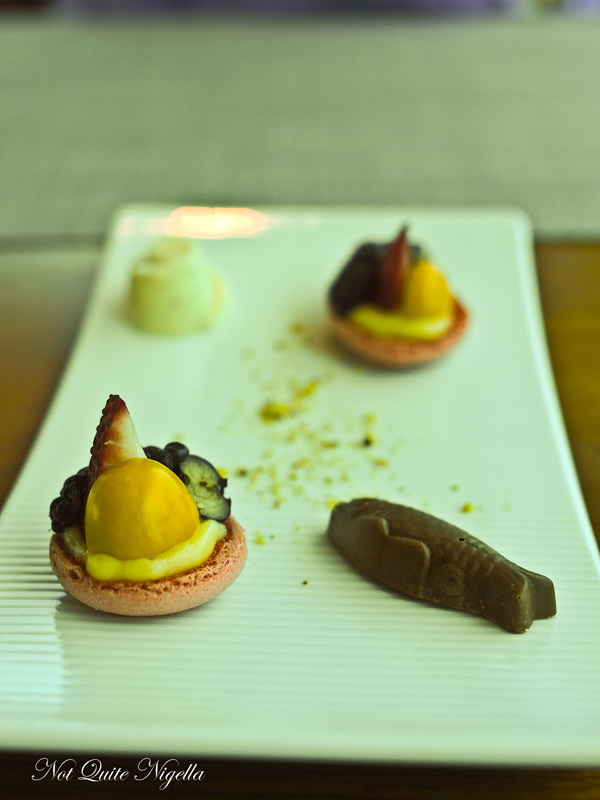 I take a bite of the perfectly made macaron on the side and sigh. So tell me Dear Reader, have you ever dined underwater? 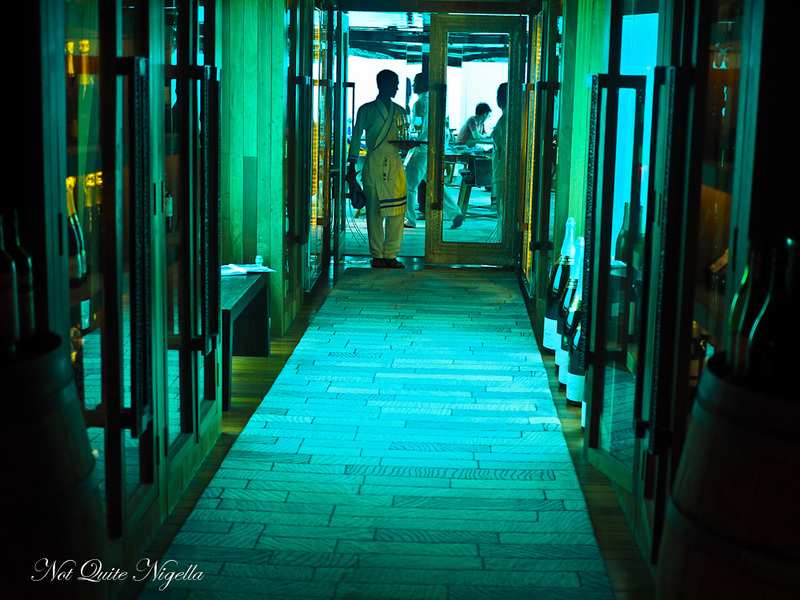 What is the most unusual place you have dined or want to dine?